The Trunyan people have a curious way of dealing with their dead. Instead of cremation or burial the corpses are wrapped in cloth and kept inside one of the baskets here until there is no more room. The oldest corpse there is then removed and laid on the ground. When all but the skull has thus decomposed, the skull is kept on the Taru Menyan tree. Apparently this practice of open burial has been going on for centuries. Technically while access to the cemetery is free and it is open at all hours, both factors are restricted. You cannot access the cemetery without chartering a boat at exorbitant prices or by going over as part of a group tour. And obviously such boats do not operate at all hours. Boat tickets can range from Rp 560,000 to Rp 700,000. You can get cheaper tickets from the ticketing office at Kedisan jetty. Get onto the boat from the jetty at Kedisan. How popular is Trunyan Cemetery? People normally club together Danau Batur and Tegalalang Rice Terrace while planning their visit to Trunyan Cemetery. You can see people only put the bodies there. Not buried them. No smell comes out. Tidy enough to put the skulls and bones. Haha. What a good experience too! Reached it by15-20 minutes by speedboat. It's repulsive to make business out of dead people. They asked us in the beginning 400.000 per person for a 10 minut boat ride to see one row of graves and a pile of rubbish. Total waste of money, biggest scam in Bali. Stupidly expensive. I am a cementeries lover and this is deffinitely the worse cementery I have ever seen. 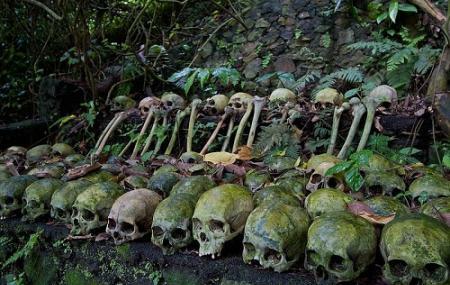 They ask for a million of Ruppies just to see a pile of skulls and mountains of rubbish so it doesnt worth it at all. Thank God we paid after negociating for more than and hour just 300k ruppies.. anyway there are million more times interesting cementeries FOR FREE in England or Spain. So up to you if u want to waiste ur time and money.